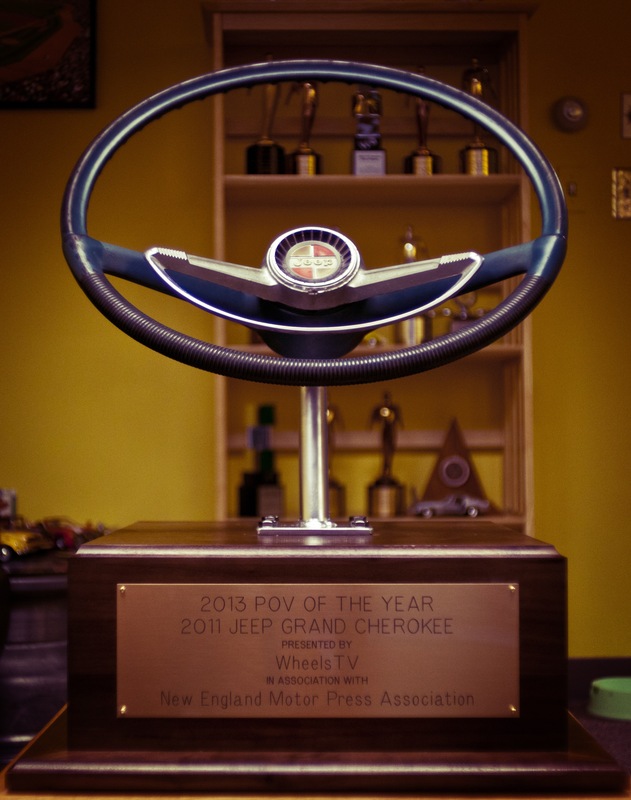 The 2013 WheelsTV POV of the Year is awarded to the 2011 Jeep Grand Cherokee for exhibiting outstanding long-term reliability, go-anywhere capabilities and exceptional consumer satisfaction. 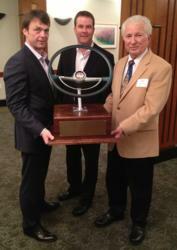 “We are delighted that the 2011 Jeep Grand Cherokee has received the Wheels TV POVY award,” said Mike Manley. “It is a testament to the reliability, value and positive ownership experience of our newest generation of Grand Cherokee"
At the New England Motor Press Association’s Annual Awards Dinner held at MIT’s Sloan School of Management, WheelsTV presented its POV of the Year Award to the 2011 Jeep Grand Cherokee. This highly acclaimed mid-size SUV won accolades from the judging panel for its reliability, well-equipped cabin and go anywhere, do anything capabilities. The WheelsTV POV of the Year award or POVY, is presented annually to one generation of pre-owned vehicle. To qualify for POV of the Year, the vehicle must be in service for at least two years and demonstrate outstanding long-term reliability and exceptional consumer satisfaction. The POV of the Year pits motor vehicles from eight very different classes, from Green Car to Light Truck, so it is a challenge to select a standout from this diverse group. This year, judging and voting took place at WheelsTV’s headquarters in Acton, Massachusetts. A juried panel composed of members of the New England Motor Press Association and WheelsTV’s writers and analysts made the final selection. Jim Barisano, CEO of WheelsTV, presented the award to Mike Manley, President and CEO – Jeep Brand, Chrysler Group LLC, and Jim Morrison, Director of Jeep Product Marketing, Chrysler Group LLC. The award, considered the largest automotive award in existence was custom built using a vintage 1971 Jeep Commando Wagon steering wheel. The Jeep Commando is considered the father of the Jeep Cherokee, which replaced it in 1973 and granddad of the Grand Cherokee, which was launched for the 1993 model year. The WheelsTV POV of the Year Award is considered the highest accolade that a pre-owned vehicle can receive. Instituted by WheelsTV four years ago, it is the culmination of thousands of hours of road tests and analysis by NEMPA members and WheelsTV writers and analysts to ultimately arrive at a deserving recipient. For more information on the New England Motor Press Association, please go to nempa.org. WheelsTV (http://www.WheelsTVNetwork.com) is the first program service in the U.S. devoted exclusively to consumers’ interests in cars, trucks and motorcycles—serving both the motoring public and enthusiast with a wide spectrum of vehicle-based entertainment, news and information. WheelsTV Network, POV Reviews, New2U Used Car Reports and Top 200+ Video Test Drives are car-shopping video series from the multi-awarding winning automotive producers for Discovery, PBS, Speedvision, Fox, MSN, AOL and Yahoo including Wild About Wheels, Dirt Rider Adventures and Motor Trend Television. WheelsTV is a program service of Automotive Networks Corporation, headquartered in Acton, Massachusetts.